Walking along carrer Carders in Barri de la Ribera, Barcelona there was this very chic salon where this guy was giving his client what it looked like a very proffesional facial massage. 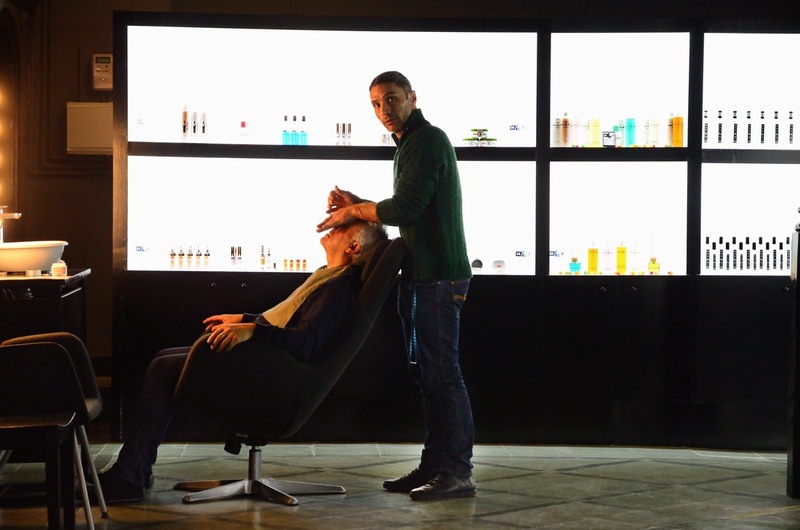 Massage is not something that I am very familiar with and thus I shouldn't be talking about here but the skillful hands gently rubbing the man's face, the light and the perfect design of the shelves in the background did make me snoop inside the shop with the camera. As you can see I could not remain anonymous in this case. The fact is that this neighborhood has grown in brand new trendy places such as this that in a way help clean the image of this part of town and attract tourists and locals alike to otherwise forgotten alleys of casc antic.